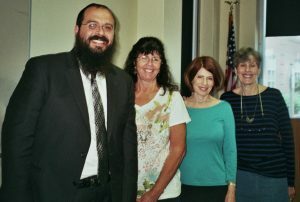 Rabbi Shalom Lubin, who serves as spiritual leader of Congregation Shaya Ahavat Torah in Parsippany, and director of Chabad of Southeast Morris County in Madison, offered a fascinating look at “Chassidism: History, Philosophy, and Contemporary Life” in a free three-part Our Jewish World series, coordinated by Melanie Levitan and Ellen Nesson. The series was held on Tuesdays, June 6, 13, and 20, at noon, at the Morris County Library, 30 E. Hanover Ave., in Whippany. (from left) Rabbi Shalom Lubin, Ellen Nesson, Melanie Levitan, and Susan Waldman. We looked into making a field trip to Chasidic communities in New York as part of the series. The workshop leader was the founder of the New Jersey Jewish Law Symposium, an annual event highlighting the synthesis and integration of the Talmud, the Jewish Legal System, and US civil law. Born and raised in Chicago, Rabbi Lubin began his relationship with the Jewish community in New Jersey in 1996 while he was studying at the Rabbinical College of America in Morristown. Before settling in New Jersey, his rabbinic training took him around the world, including to Sydney, Australia; Bellevue, Washington; and Minsk, Belarus.